Operation USA has enthusiastically supported the Awesome Girls program in Louisiana since Hurricane Katrina struck the area in 2005. In an environment focused on fun and connecting with peers, the program’s initiatives are aimed at nurturing the participating girls, building resilience and fostering life-affirming behavior. Last January, we sent the Awesome Girls to see the Oscar-winning film Hidden Figures. The outing provided an opportunity for the girls to experience the success story of some amazing women and to be inspired to aim high in their own lives. 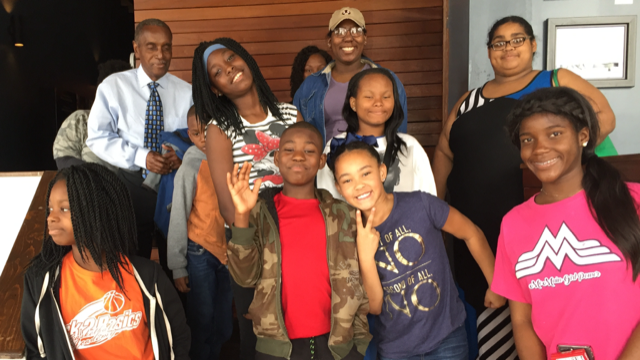 This month, thanks to the support of our donors, we were able to continue our “Movie Day” tradition and send the girls to see the record-breaking film Black Panther. The Girls loved everything – Wakanda, vibranium, the technology, the colors/costumes/art direction, Black Panther (of course!) and the talented, smart and powerful Women of Wakanda! Specifically, our Girls loved the sassy and brilliant inventor-Princess, the powerful and loyal leader-General, the insightful and capable activist-spy, and tough yet beautiful matriarch-Queen. Social worker, researcher and TED Talk lecturer, Brené Brown, recommends that folks acknowledge all their gifts with hyphens or slashes. How can you pick one? Divide yourself up? The female characters featured in the film were awesome role models of what we hope our Girls aspire to become: multifaceted and effective people. Two little boys accompanied their Awesome big sisters on the outing. Neither had ever been to a movie theater. Their three older sisters hadn’t either – – until Operation USA invited them to “Hidden Figures” last year. What a blessing you are to our Girls and their families! The Girls will discuss other facets of the film in coming weeks (e.g., how important is parenting to children? Would the antagonist have turned out differently? How does race, gender or other “-isms” affect what is important to all of us?). The movie is rich in issues. We are so pleased to be able to provide life-enriching experiences like these for the Awesome Girls and their families. Thank you for your support in making this possible. Donate to the Awesome Girls program (and all our ongoing work) at give.opusa.org.